Talk about an autumn classic - this autumn themed wine bottle stopper favour can't be beat. They'll be stopping up the wine bottle but there'll be no stopping the memories each time your guests make use of these festive favours. Each 4.25" x 0.75" x 0.75" favour has a sturdy metal core lined with a black rubber stopper rim topped with a stylishly-tilted leaf silhouette. 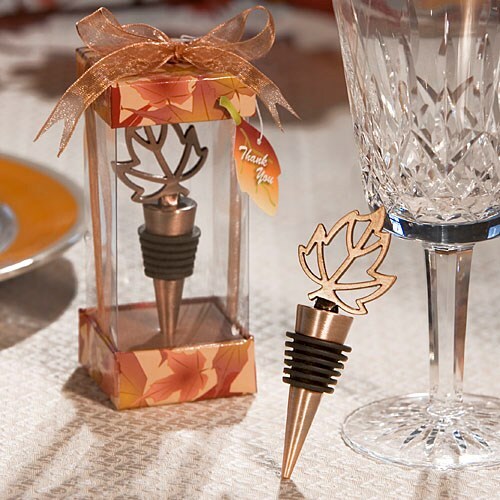 Each bronze metal wine stopper is packaged upright in a deluxe clear box with a fall design top and bottom allowing a dramatic 360 degree view of the favor, finished with a sparkling bronze organza bow and a designer leaf shaped thank you tag attached.